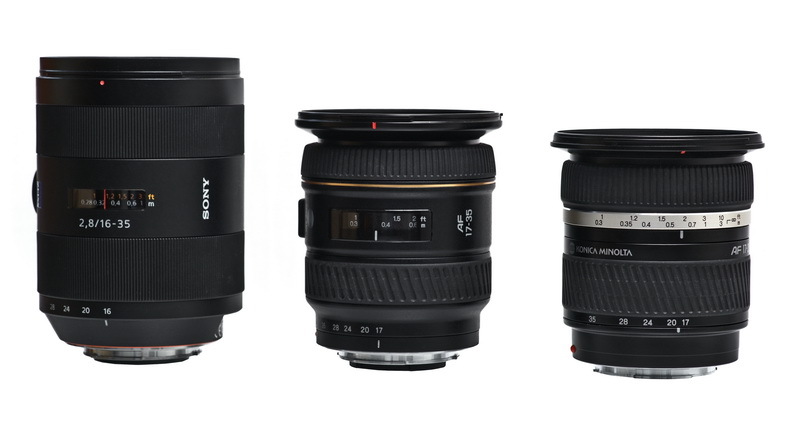 This comparison review will involve the Sony Carl Zeiss 16-35mm F/2.8 SSM, Minolta AF 17-35mm F/3.5 and the Konica Minolta AF 17-35mm F/2.8-4. I'm only going to use the full frame A900 for the review below, to save time, and avoid making the page way to long and repetitive. These lenses are really meant to be used of full frame cameras, and aren't all that wide when used on APS-C bodies. To see the complete individual lens reviews with full frame and APS-C results, go to the links above. Front and rear caps, hood, soft-case and users manual. Front and rear caps, hood, hard-case and users manual. Retailed for $1700 in 2000, that equals about $2200 today. Focus distance window with focal length index marks at 17mm, 20mm, 24mm, 28mm, and 35mm. Focus distance scale, with focal length index marks at 17mm, 20mm, 24mm, 28mm, and 35mm. The Sony is the biggest, (and heaviest) of the bunch, while the Minolta G and KM (Konica Minolta) are about the same size. The KM is the only lens that increases in length as you zoom out. You may also notice the front elements have different colored coatings, which is a good indicator of design/production date. When looking at the tables below, note the Minolta G starts at F/3.5, the other two start at F/2.8 when at the widest focal length. At 35mm, the KM starts at F/4 , so the crop will be missing at that length, and I've written "intentionally left blank" in that block. The Minolta G starts at F/3.5, which goes along side of the Sony F/2.8 crop. In other words, the Sony will always have the first crop at F/2.8. The Konica Minolta will start at F/2.8 at 17mm, and F/4 at 35mm. The Minolta G will start at F/3.5 at both lengths. Also, the Sony will be at a slight disadvantage because it starts at 16mm, instead of 17mm, which makes the objects inside the center and corner crops at 16mm seem just a little smaller as compared to the KM and Minolta G. I did this because most people will not use 17mm on a 16mm lens, they naturally crank the zoom to the widest angle, and even if I did use 17mm, there would be charges that I'm trying to favor the Sony. In reality, the Sony is not hurt from this disadvantage. Let's see how much light fall-off we have with each lens, starting off at 16mm with the Sony, and 17mm with the others. It looks like the Minolta G has the most light fall-off. The KM has less overall, but it falls off hard, and almost clips the corners when using a regular filter at 17mm, although all three lenses show some additional light fall-off using filters at the widest focal length, the KM is the worst. The Sony has the best overall control. On all lenses, light fall-off diminishes some as you stop down. The Sony has the best control of light fall-off at 35mm. The Minolta G and KM have moderate amounts at F/3.5-4, but this really doesn't show up very much in real pictures. The KM blank space is a result of the variable aperture, and starts at F/4 at 35mm. Let's see how much distortion we have with each lens, starting off at 16mm, or 17mm, depending on what length the lens starts at. All three lenses show complex wave-type distortion at the widest focal lengths. The Minolta G has the least amount, and the KM has the most, but only slightly more than the Sony. The Sony comes in last in distortion control at 35mm, showing moderate pincushion. The Minolta G is nearly flat, and the KM shows mild pincushion distortion. Flare and ghosting at 16mm-17mm below. The small pictures above show the entire image, but are still large enough to illustrate the differences between the lenses. The Sony has the best control of glare and ghosting, the KM not far behind, both showing mostly green ghosts. The Minolta G is easily the wost offender, showing orange and blue blobs in a line from the sun. Full screen shots with the Minolta G look bad. Sun centered shots look good with the Sony, and not very good with the Minolta G and KM. The KM shows a nasty red ring around the image periphery, the Minolta G has a two step, diffused, but large orange ring that covers most of the image. The 35mm shots look good with the Sony and KM, with little glare, but do have some green ghosts when the sun is near the image. The Minolta G is bad, showing massive (mostly) orange blobs, and should probably not be used when the sun is near the image unless you want an artistic feel. Overall, the Minolta G is by far the worst at controlling ghosting at any focal length, the Sony is the best. The sun centered shots look good with the Sony and KM, the Minolta G has an orange diffused ring, covering most of the image. Now on to some center crops at 16mm/17mm. Check out the boring center crops. You'll notice there isn't much sharpness difference in the center crops, even wide open. The exposures times were the same for all lenses at each aperture, and it seems the KM requires a little negative exposure compensation to match the other lenses. Super-wide zooms are typically pretty sharp at their largest aperture, and widest focal length, like 16mm/17mm here, so the results above are expected. For better sharpness crops, go to the regular lens reviews. Obviously, the Sony has the sharpest corners, and stopped down to F/8-11, the KM looks better than the Minolta G, which is a surprise. All corner crops were taken at the same location within the frame, about 500 pixels from the very corner (left) of the image. I re-positioned the Sony slightly so it would not have an advantage from being farther from the corners, since it's wider than the others. Exposure times for the corners were the same as the center crops, and the exposure differences here are from light fall-off. The 35mm centers show the sharpest on the Sony, but the Minolta G and KM are not too far behind. The KM seems to have a bit less contrast than the Minolta G.
Check out the 35mm corners below. The 35mm corners on the Sony are much sharper at all apertures than on the KM or Minolta G. I see some heavy color fringing on the Minolta G, less on the KM, and none on the Sony. The crops above were exposed the same as the centers, but are darker because of light fall-off. Check out the coma samples below. Coma shows up near the image periphery in these lenses, but the Sony has superior control. The shape of coma on the KM and Minolta G are different, but are about equally noticeable when viewed at normal sizes. The two older lenses show strong coma at full apertures, but are about average for yesterday's super-wide zooms. Lateral color fringing crops below. There isn't much difference in visible color fringing along the sides, though the Minolta G seems to have the least. The softness of the sides shows up more on the KM and Minolta G, the Sony has loads of contrast. These 100% crops were taken from the middle-extreme left side at F/5.6. It also shows the difference between 16mm, and 17mm. I cropped the images equally, so the slightly wider Sony wouldn't have an advantage. These crops also show the Minolta G has a very subtle green cast as compared to the other two, that's no big deal though. The Sony is a very good lens, and it out performs the other lenses in almost all areas tested above. The only deficiencies of the Sony are color fringing and distortion, and the Minolta G is the best in those areas, but not by much. The Konica Minolta turned in good results also, and you'd be hard pressed to see the differences between the Sony and KM unless looking at 100% crops side-by-side. The Minolta G is a good lens, but is lacking in a couple of areas, especially ghosting, where control is poor; the corners are decent, but not quite as sharp as the much less expensive KM when stopped down at the widest focal lengths. In a nut-shell, the Minolta AF 17-35mm F/3.5 G seems a little dated. It's built well, and I like the way it feels and handles the best of all three, but due to poor ghosting control, and mediocre corner sharpness, I'd pass on this lens, especially since it sells on eBay between $1000-$1500, that's just too much money based purely on optical performance. The Konica Minolta does a very good job, when stopped down and viewed at normal sizes, you may not see the difference between it, and the Sony. The selling price For the Konica Minolta AF 17-35mm F/2.8-4 at the time of this review is about $300 on eBay, That's a real good deal, and $1600 less than the Sony!! 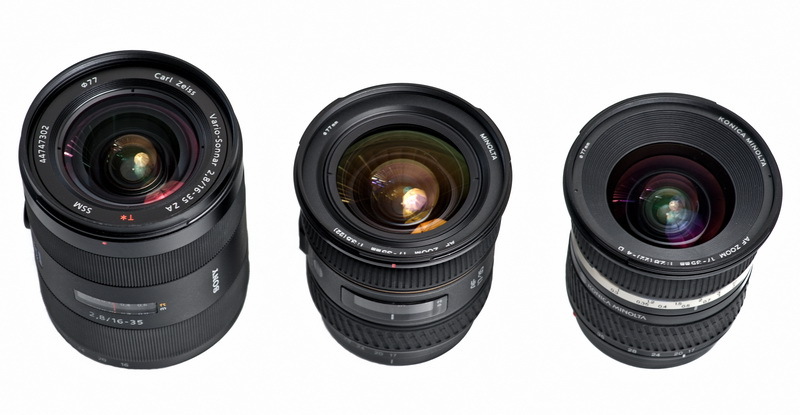 The Sony Carl Zeiss 16-35mm F/2.8 is a great lens, and very expensive. The color and contrast are superb. If you make a living using this focal length, I'd go ahead and pay the retail price of $1900, it's worth it. If you're an amateur with a bunch of money, and demand top-notch image quality, get this lens.